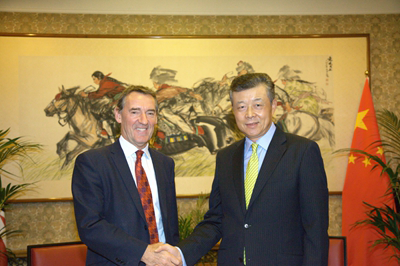 On 17 November, Ambassador Liu Xiaoming met with Lord O'Neill, British Peer and former Commercial Secretary to the Treasury at the Embassy. Ambassador Liu spoke highly of Lord O'Neill's contribution to the development of the China-UK relations over the years, particularly as the Commercial Secretary to the Treasury when he was committed to pragmatic cooperation between the two countries and played an important role in promoting the "Northern Powerhouse" and strengthening international cooperation on anti-microbial resistance. Ambassador Liu hoped that Lord O'Neill could continue to offer his advice and suggestions in support of the "Golden Era" of the China-UK relations, and make new contribution to deeper exchanges and cooperation between the two countries. Lord O'Neill said that after the Brexit referendum and the UK government reshuffle, the "Golden Era" of the China-UK relations still enjoyed good development momentum. Both countries were facing historical opportunities for closer exchanges and cooperation in various fields. He believed that as exchange and communication between China and the UK continued to increase, the "Golden Era" would gain more popularity and show greater potential. Lord O'Neill said he would continue to work towards this end. The Ambassador and Lord O'neill also exchanged views on the current world economy and the trend of globalisation.